I make Mango Pulp when I have too many mangoes ripening way too fast. The fruit pulp of different Mangoes can be so useful even months after the harvesting season, plus the sweet mango pulp tastes great months later! So how do you make Mango pulp from scratch and how do you store the pulp so that it remains good for a longer period of time? This might surprise you, but making mango pulp is super easy and tastes of course way better then the store bought mango pulp. Commercially available Mango pulp packed in cans and vacuum bags tends to taste less fresh and come with an un-pure mango flavor, which might be because of added chemical preservatives. 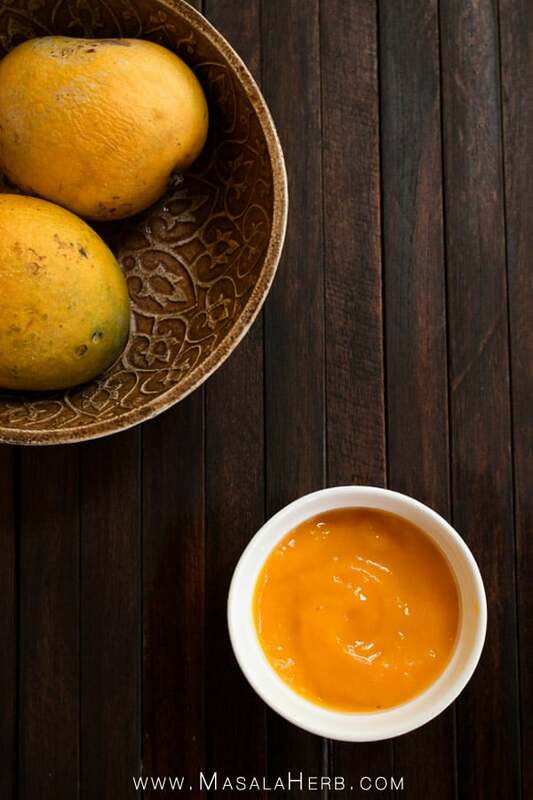 The lowest mango quality grade is used in commercially available mangoes, so you don’t really get the best mango pulp for your homemade precious desserts. Nowadays, you can buy mangoes all over the world. The mango fruit has come a long way in the past 20 years, it’s as common as bananas in grocery stores in 2017. 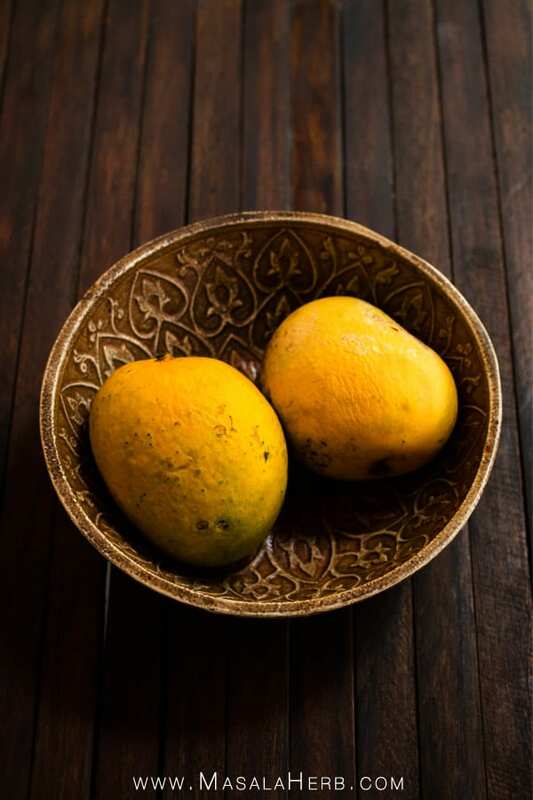 The ripe mango season, in Asia, sweetens the steaming hot summer from April to June. You can buy mangoes too during other times in the year, however, that is not suggested since the Mangoes won’t taste that great. In Europe, you can get hold of Mangoes from Brazil all year round. I am not a fan of Brazilian Mangoes so I won’t comment on that any further. However, getting these “off-season” Mangoes is in many cases still better than buying preserved Mango pulp in a can. When you live in India South East Asia, Brazil, Hawaii and similar tropical environment, and you have a mango tree, you will end up with way too many mangoes to consume in time. Usually, neighbors exchange a shopping bag full of mangoes among each other, because after all, not every tree bears the same mango variety and even if, the mango will still taste differently. Mangoes are quite mysterious fruits. Having 2 bigger Mankurac Mango variety trees in our garden, I can tell you that both trees produce different tasting mango fruits. Yes, the base flavor is the same but the age of the tree, it’s seed origin, the soil where it grows, general location, weather conditions of the previous months and the amount of watering determine the end resulting mango fruit flavor. There are countless Mango varieties, with my favorite being the massive Bishops Mango. The most common Mango type in the world in the Alphonso Mango and the most commonly available mango pulp in stores is of the same mango variety. I don’t particularly enjoy Alphonso mangoes, as others do. It’s a mainstream mango, so it suits most people to a certain amount. The advantage of Alphonso Mangoes is that they don’t have that many fibers. Use up ripe and soft mangoes before they go bad – sometimes a batch of very ripe mangoes is sold at a very low price, that’s when you use your smart and buy the mangoes and turn them into a pulp. If you have a mango tree with a lot of fruits, finding ways to use the mangoes quickly and to store them, is a necessity. Just pulp the mangoes and store for later! Pick your favorite Mango variety to pulp – if you have more then one mango variety you can choose to pulp each separately or you can mix them up. Some Mango varieties are better suited for Mango lassies too and others for cakes and this is something you could explore. You get to choose your mango pulp flavor. You know what’s in your mango pulp – you make it so you know there are no added sugars or preservatives, plus you get to pick the quality of your mangoes used to ake the pulp. It’s easy and almost effortless and tastes way better then the store bought canned or vacuumed packets. Homemade mango pulp won’t disappoint you and won’t turn bad if stored properly. Freezing Mangoes as a whole with the core is not a good idea. The mangoes turn ugly when defrosted, mushy and kind of not flavorful. That’s why we make mango pulp. As you can see in the video, cutting off the ends first will save you time in peeling the mangoes. That way you can cut the fruits without much mess, way faster and you need a quick method to cut a lot of fruits effectively without loosing the precious sweet mango juice. Some Mango varieties have more fibers/strings in the flesh than others. That’s why Alphonso mangoes tend to be popular because they are almost without fibers. Yet, there are 100+ more mango varieties in this world and half of those don’t have fibers, so don’t limit yourself to Alphonso only, however, use a mango variety with fewer fibers or you will need to strain the pulp since the fibers can be annoying. Once you have cut off all the fruit flesh around the core and discarded the peel, you can cut the mango into chunks. Then place them in a mixer/blender and just mix to a smooth paste. Don’t add water or sugar. I wouldn’t add any flavoring like cardamom or saffron at this point since you can always do that later. Keep it natural and simple, so that you can use the pulp in various ways later in your food preparations. To store the mango pulp/puree, keep a few vacuum zip bags ready. Fill the zip-lock bags with the pulp, close and place into the freezer. You can use bigger or smaller bags, I prefer the smaller ones, batch-wise because it’s easier to defrost when I want to use only smaller quantities. Also vacuum zip-lock bags are easy to use, just open and use, and keep the mango pulp in perfect condition in the freezer. It’s more hygienic too and you will find that storing filled zip-lock bags will save you space in your freezer, compared to Tupperware boxes. For one big bag, I used approximately 4 smaller mangoes the other day, so mango pulp is quite compact too in the freezer. Whole fresh Mangoes - Ripe orange or still green Mangoes. Cut off all the fruit flesh around the core and discard the peel, you can cut the mango into chunks. Then place the mango flesh in a mixer/blender and just mix to a smooth paste. Don't add water or sugar and flavoring. Keep it natural and simple, to use it further in other dishes. 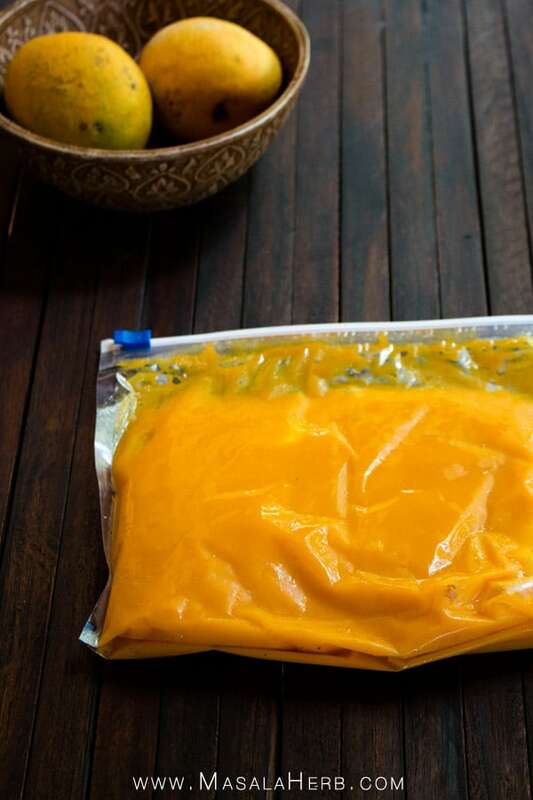 To store the mango pulp/puree, keep a few vacuum zip bags ready or store in ice cube trays so that the pulp takes a square shape. Fill the zip-lock bags with the pulp, close and place into the freezer. Take out whenever needed and use further in your food preparation. 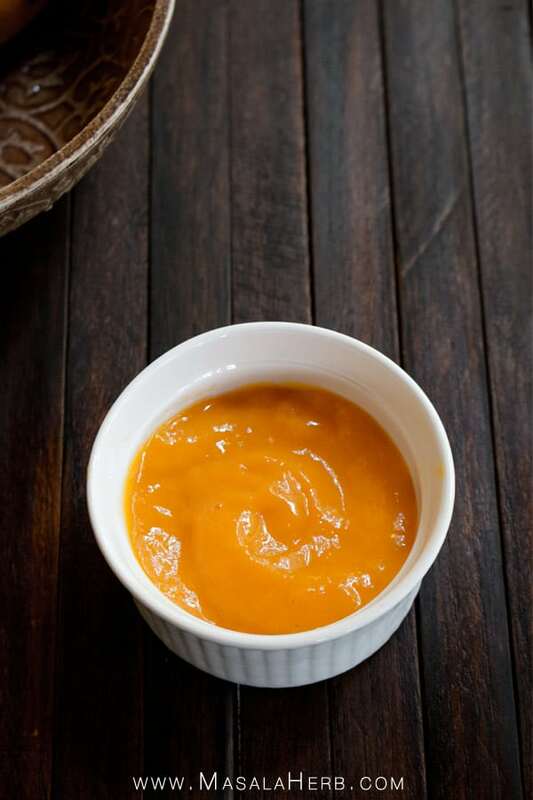 You have countless recipe options to use mango pulp in your food! 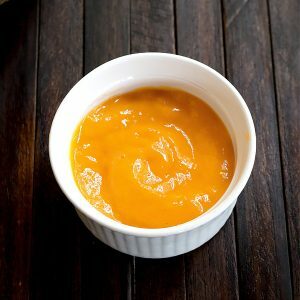 I searched the web and asked my friends to share their favorite ways to use mango pulp. So besides the common uses such as Mango Juice, Mango Milkshake, and Mango Lassi, I was looking for more creative Mango pulp recipe ideas. Some of the mango pulp recipes call for commercially available mango pulp, however, you can just use your homemade pulp instead. Dear Reader, How will you use your Mango Pulp? 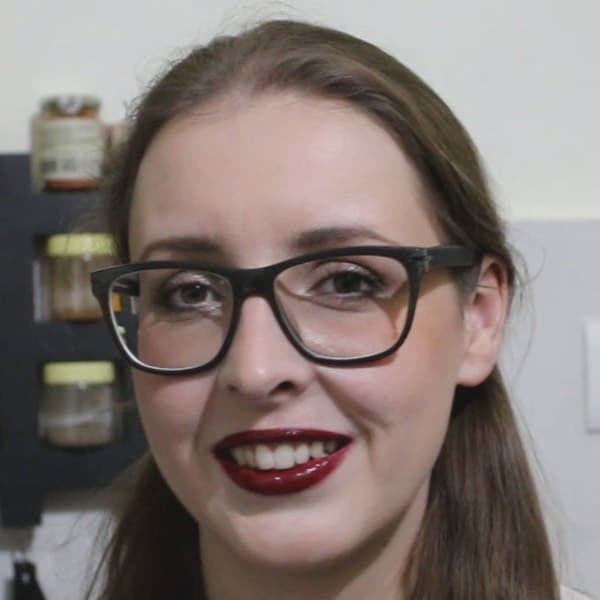 Great tutorial and informational post Helene! Obviously, mango is a local product here, so we have to rely on what gets shipped in, but I do take advantage of it when I can. I’ve never considered buying extra and making pulp to freeze. That would be SO good in our summer smoothies. Thanks! I will buy some more and freeze them when they are in season. The varieties we get here ain’t fiberless and the stone is quite huge. I heard that Indian has the best mangoes. My wife does the same with pumpkin but somehow we have never thought about making the same with mangoes. Thanks for the great idea! I love recipe ideas like this and just wish people would make their own rather than buying store bought. 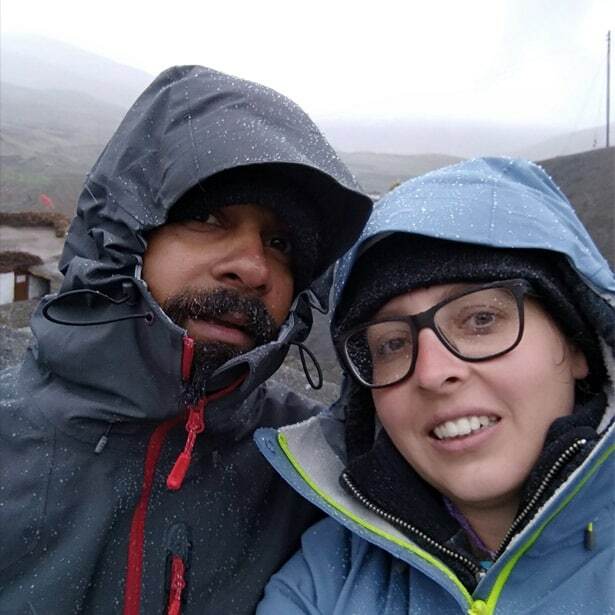 Like you, we love to know what is in the food we are eating. A great way to use mangoes before they spoil. Fantastic ideas, these! We never have mangoes long enough in the house to go off (my kids are fruit fiends!) but if I ever do I’ll definitely try these ideas out! As soon as I read “In Europe you can get hold of Mangoes from Brazil all year round. I am not a fan of Brazilian Mangoes so I won’t comment on that any further” I knew we were sister mango lovers as that’s exactly how I feel. Here in the UK I wait eagerly for Indian and Pakistani mango season when we can get good quality imports, but I rarely have enough to make pulp, as they are, while not expensive, not cheap enough to have a glut. But once a whole box became ripe so quickly I made pulp to freeze and use for a sorbet and that was great! 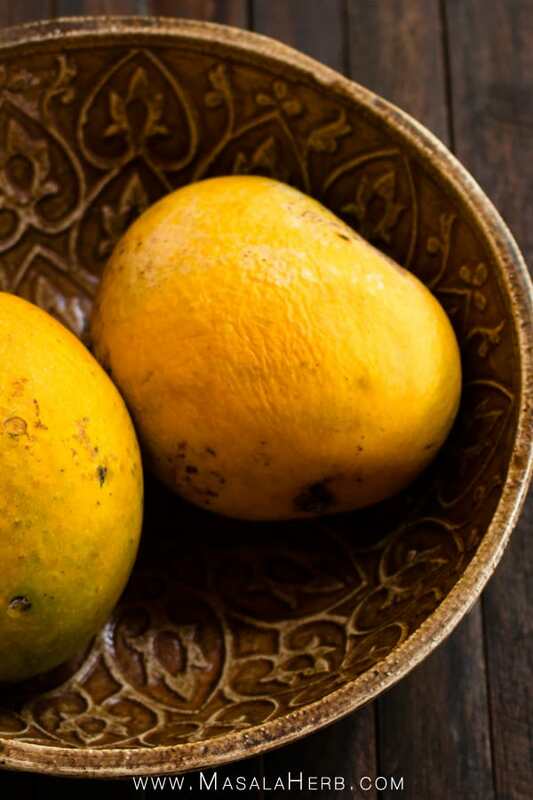 I would request you to make a correction to what you wrote: ” I think, once you have tasted Indian/Asian Mangoes, you will never go back to the Brazilian Mangoes. ^.^” This sentence might be valid to some varieties of Brazilian mangoes you bought in Europe. The story is that brazilian planters imported mango grafts of Haden, Tommy Atkins, Kent, Palmer which have qualities of high yield, low fiber, colour, size, weight, firmness and long shelf life and plant them for export.. These varieties in Brazil are used more for juice . You have to visit Brazil and try the Rosa and Espada varieties. Carlos I bet you are right, the varieties available in Europe from Brazil are just to keep the Europeans happy with mangoes because they don’t know any better. I wish I could try the real deal, the quality varieties in Brazil to compare with the ones we get in Goa. Yet, Carlos you should try the Indian mango varieties, they will take you to fruit heaven. ICAR in Ponda has a recent publication on varieties of Goa mangoes. Ok, I will take your word. Looks like I need to catch up on my Brazilian mango knowledge. If you say they are that good, then I ought to get to try some one day. Where di you see that article? I just found a very short TOI article, where they don’t even count up the different varieties. There are so many different varieties. We have one tree in our garden, which we don’t now the mango variety. I am still looking for somebody who is ready to exchange some bishops mangoes with some of our mangoes. 😀 We have mankurads and 2 unknown varieties (which are amazing) to offer. thanks for your information on Mango Plant Grafts available in ICAR Ponda. Good post! Alas, mangoes are expensive here, at least most of the year, so I rarely have extras. But sometimes their price is quite reasonable, and I should take advantage of that and make pulp! I would be in heaven with a mango tree outside. I wouldn’t need to save the pulp, I’d just eat them until I exploded. I’ve dried mango cheeks before and frozen them but never pulp. What a great idea! Can I store mango pulp in fridge if that to be used next day. Yes you can. You can store it for a few days in the fridge before it goes bad.